Model T Ford Forum: Piston Ring Gap - Should I Return Them? Piston Ring Gap - Should I Return Them? Model T Ford Forum: Forum 2014: Piston Ring Gap - Should I Return Them? My goal over the Christmas holiday was to assemble the engine for my 16 coupelet. As usual a few things have cropped up that are slowing me down. I checked the ring gap on the set I bought from Snyder's and the top ring gap is .030" in all the bores. Mind you my block is standard bore, yes I've checked them many time and they are standard bores. From searching on the forum it appears that .012 to .016" is ok to run for gap. Should I order .030" over rings and file them down or run it the way it is. That's way too much gap, Have you measured the cylinders with a micrometer? Have you tried the gap of the top ring in the bottom part of the cylinder? The bore should be the same at the top and at the bottom and also the same front to back and side to side. That is both round and not tapered. As the cylinder wears, and gets larger with wear, the gap will increase, so maybe you need to re-bore the engine and replace the pistons. If you are perfectly sure the cylinders are allright, you might have the wrong rings, but my guess is the cylinders are worn. Remember the gap increases by Pi times the diameter. more that that and they ran good. I agree with Harold....much better to have excessive ring gap vice too little. I would assemble with what you have and start having fun. If the block has a standard bore and has not been sleeved at some time, it undoubtedly has some wear. If the rings have 30 thou end gap, chances are that the pistons are too loose in the cylinders, which will result in "piston slap" noise. Norm has the right idea about measuring the cylinders in all directions and at different levels in the cylinder. If all those measurements are within one or two thousandths (two is really pushing the limit), you can put it together and it will run for a long time. If the measurements vary more than that, you'd be better off having it bored. I've gotten new pistons and rings before for a newly-bored engine where the rings had 20 thou end gap. I used them like that, and they worked fine. But I think 30 is too much. I'd get oversized rings and file them to fit. Yes I've measured the bores many times, they measure 3.752" to 3.753" if I remember right. The original pistons slip in nicely. My gpa did not have it bored because it doesn't need to be. I'm going to call Snyders and see if they can exchange the rings with an oversize set. Philip, Take some good advice and get the O/S rings and gap them to the recommended tolerance. Here's my experience, I've heard from engine rebuilders that it is common for the rings from the suppliers to not have the proper ring gap. I installed rings like you are considering and after a few miles and several tours I started to notice blue smoke coming out after leaving a stop light. My oil consumption also was way up. I installed new rings but didn't help for long... I finally decided I was going to fix the oil burning no mater the cost on my '12 block. Researching some custom fit rings I found that I was close to the Grant ring company. There the guy told me I could simply install some .080" O/S rings in the .060" bores which were worn. I fit and gapped the rings and the engine runs without whisp of smoke and doesn't use any oil. Yes, you may hear a bit of piston slap sometimes but to see a guy driving an oil smoking, burning car around sure doesn't do the hobby any good here in SoCal especially. Guys that follow me on tours also gotta love it. Your clearance is not that bad for unbored cylinders. The rings have to big of gap. But if the pistons slap, it is from out of aligned rods. 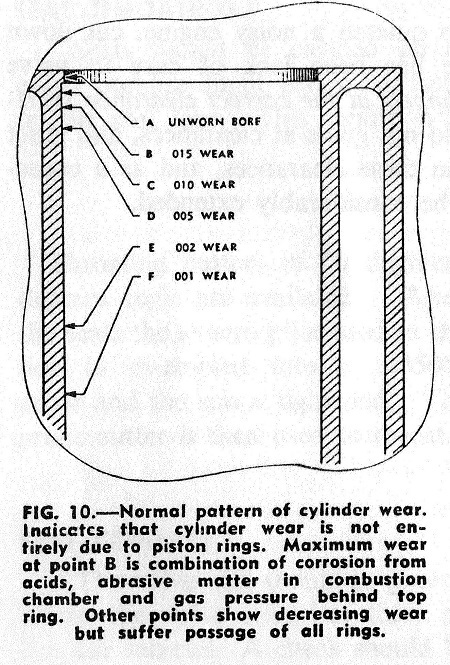 The more the cylinders wear from bent rods, the more noisy the pistons. Use Hasting rings always, new or used cylinders. They use all cast rings! I would want to tighten that gap up a bit. While it won't cause any issues, it certainly isn't helping either. I use .030" gap on nitrous oxide equipped small block v-8's or if the pistons are hyperutectic cast aluminum. A .010" oversize set is all you need. .030" is way to big to whittle down to what you need. In the performance engine world, most file fit ring sets are .005" bigger than the bore size. Also, there is a special tool used to "file" rings down, as it keeps the gaps square. A' would not apply to a T bore when checking as the ring go's all the way to the top on the cast iron pistons, so start with the B and check all the way down. Can be done as simple as pushing a new ring down the bore in stages. I agree with the guys that say to get some +.010 rings. I would file the top ring to have a clearance of .020". The second can be less, around .016 to .018. The oil ring can be .015. If the 10 over rings are any looser just put it together with whatever comes up. You know they will be tighter than the standard rings. Measure the ring gap by putting each ring in its cylinder and pushing it down the cylinder half way with a piston to keep the ring straight in the cylinder and then checking the ring gap. The oil ring should be pushed about 3/4 of the way down. Never install a piston with any rings with the gap above a piston pin. Never put the pistons in with ring gaps directly above the ring below. Example: with the front of the engine being 12 o'clock place the top ring at 2 O'clock, the next ring at 8 and the third at 4. If there is a forth ring it can go so the gap is near the top ring at 3 or 4. It is not super important, just be sure they are not all on the same side of the piston. I too like Hastings rings. also American hammered. Have used a lot of Grant too with good luck. Always be sure to do a nice job of removing the ridge before pushing the pistons out. Aaron - Never a ridge on a stock Model "T" as the top edge of the top ring stops flush with the surface of the block. You're right Harold, but what I wrote should apply to any early engine with a 3 1/2 to 4 inch bore. Hastings rings are the best but I picked up the .080 ones from the Grant store for 32 bucks. I sort of liked the spring insert in the oil ring. I think I used .014 top .012 and .010 for the oil ring. It was sort of a guess on how much to grind off the spring insert. I just made sure I had plenty of extension pressure. It sure made a difference for the $32. and I was ready to spend thousands if needed.